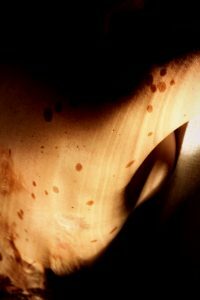 Psoriasis guttata at 8 years old. Without still being conscious, at this age the project was born, the most personal of all. Whenever I knew a person, what I was most interested in was their skin, and although at first it was a fixation of my own weakness, with time it became my charm, even a sign of identity and unintentionally I started to understand it like that of others too. Strength, sexuality, sensitivity, but above all freedom. Visual and emotional freedom, without terms that can limit or reduce it, the skin is what it wants to be and I just want to observe it as it is.